What May Be Appropriate for You? 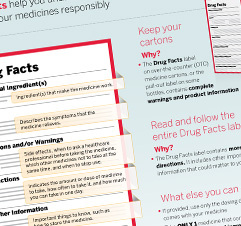 Your age, health conditions, and other medicines you are taking may affect your choice. How you choose OTC pain medications and how you use them are important. But forgetting to check the dosing instructions for your pain relievers could put you at risk. 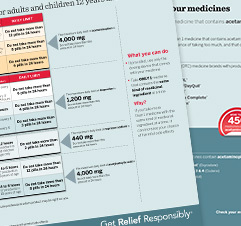 GET RELIEF RESPONSIBLY® provides tools to help you choose, use, check, and store over-the-counter (OTC) medications responsibly. Do you know the different OTC pain relief medicines? 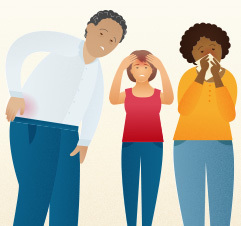 OTC pain medicine differences can matter to your health. 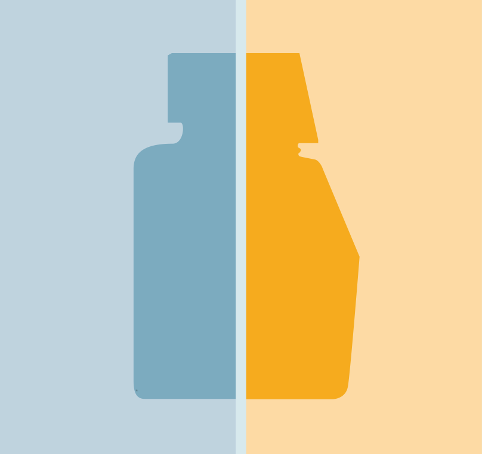 Take ONLY 1 medicine with the same kind of medicinal ingredient (acetaminophen or NSAIDs) at a time. What the warnings, directions, and other label facts tell you. Have a throbbing headache, nagging back pain, or pain due to a cold or the flu? Find tips to effectively manage your pain. Links provided here are for informational purposes only. No endorsement or affiliation is implied. Please note that this content is not intended as professional medical or healthcare advice and is not intended as a substitute for professional healthcare advice, or services from a qualified healthcare provider such as a physician, pediatrician or other professional familiar with your unique situation. This content is intended solely as a general product and educational aid. If you have any questions, please consult your physician or pharmacist. This site is published by McNeil Consumer Healthcare, division of Johnson & Johnson Inc. which is solely responsible for its content. It is intended for visitors from Canada only. Third party trademarks contained herein are registered trademarks of their respective owners and not of McNeil Consumer Healthcare, division of Johnson & Johnson Inc.